The days of pedestrians and cyclists fighting for scraps of space on the Brooklyn Bridge may be numbered. NYC DOT has initiated a study of expanding the narrow promenade, which is too crowded to work well for pedestrians or cyclists for most of the year. The Times reports that the city has retained engineering firm AECOM to study the feasibility of widening the pathway, which has not been expanded since the bridge opened in 1883. Stories about conflict between walkers and bikers on the cramped promenade have become a rite of spring in New York City. As soon as the city thaws out from winter, people head out to walk or bike across the Brooklyn Bridge in numbers that the path, which is as narrow as 10 feet on some sections, cannot comfortably support. In a conceptual rendering (above), DOT shows a wider promenade with a central bikeway in the space occupied by today’s shared path, flanked by walkways on both sides. Calls to expand the bridge path have intensified in the past five years. In 2012, council members Margaret Chin, Brad Lander, and Steve Levin, along with Transportation Alternatives, called for widening the path to 34 feet, equal to the points on the path that skirt the central columns of the bridge towers. With the impending redesign of the Tillary/Adams approach to the Brooklyn side of the bridge and the expansion of Citi Bike to nearby neighborhoods, widening the bridge path is increasingly urgent. This summer TA has been surveying people who bike on the bridge path about what they’d like to see improve. In more than 500 surveys, the overwhelming consensus is that the bridge path needs to be wider, with physical separation between cyclists and pedestrians, said TA’s Caroline Samponaro. TA volunteers in Manhattan and Brooklyn will be doing more organizing for a better bridge path going forward. You know, this bridge used to have four lanes of streetcar tracks on it. I have a suggestion for the poor cyclists who have to contend with “clueless” pedestrians — WALK YOUR BIKES ACROSS THE BRIDGE — IT WOULD DO YOU GOOD AND DEFLATE YOUR SWOLLEN EGOS! You seem to be the one with the swollen ego (and I’m not even a cyclist). So the horses from the Haskell are “tosses”? Thanks for the laugh! 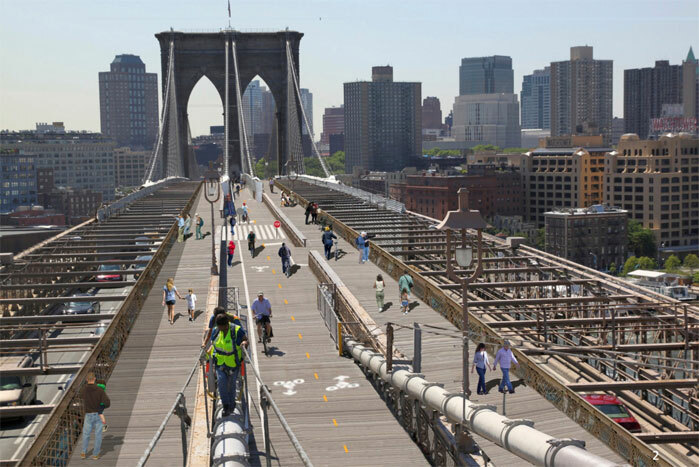 The city will soon start a multi-million dollar overhaul of the Brooklyn Bridge, and while they're adding more space for cars, they're not doing anything about the havoc on the shared cyclist-pedestrian walkway.